Back adjusts to 6 different positions. Reinforced frame for unmatched durability. Mesh back is removable for easy cleaning. 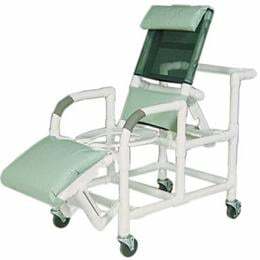 Straps and buckles make the back adjust easily for each patient's comfort. Arms swing back for easier lateral transfer. Padded elevating leg rest for "easy-chair" feel. Footrest for lower leg support when in the upright position. A 7 quart pail with easy remove/install rail system is standard.